Enhanced molecular ions with Cold EI and improved NIST library identification. Provides second dimension elution time correlation with sample molecular ions for their easier separation and identification (novel concept of GCxGCxMS). Enhanced structural and isomer MS peaks. TAMI software is available for the provision of elemental formulas based on unit resolutions single quad data for further improved sample identification. Tunable GCxGC injection time for full compatibility with the scan speed of quadrupole MS while the Cold EI interface seamlessly accepts the high second column flow rate. Inherently eliminates any ion source peak tailing thereby exhibits improved second dimension separation for "difficult" compounds. Fully eliminates any adverse second dimension GC column saturation (fronting) effects. Uniquely includes backflush device for improved column maintenance and shorter analysis time. Simple and easy to use GCxGC modulator compared with thermal modulation GCxGC. Does not require any cryogen (CO2 or Liquid Nitrogen) for its operation (lower cost of operation/maintenance). Comprehensive two dimensional GCxGC improves the separation of GC. However, in the form of thermal modulation it suffers from complexity and high cost of purchase and cooling gases. In addition, GCxGC-MS is perceived to be limited to time of flight MS due to the need of fast scan speed for its narrow peaks. We developed [1-3] a novel method and device named pulsed flow modulation (PFM) for obtaining GCxGC-MS with Cold EI (supersonic molecular beams interface and fly-through ion source) based on the use of quadrupole mass analyzer, and without any added gas flow rate. With reference to Figure 1 left side scheme, sample compounds which elute from the first GC column are temporarily stored for a few seconds in a fused silica transfer line and are pulsed periodically injected by ~25 ml/min He gas pulse into the second column while simultaneously temporarily stopping the first column flow. After the pulse, 20 ml/min He develops the chromatography in the second column for a few seconds. The PFM is a simple and reliable device that does not require any added gas. The PFM injection time can be tuned, and as a result the combination of PFM-GCxGC and the Aviv Analytical 5975-SMB GC-MS with Cold EI is fully compatible with the scan speed of its quadrupole mass analyzer while the increased PFM flow rate is seamlessly handled by the nozzle chamber differential pumping. Thus, PFM-GCxGC in combination with the Aviv Analytical 5975-SMB Supersonic GC-MS provides a unique combination of improved separation and ultimate mass spectral information. The Aviv Analytical PFM-GCxGC is an add-on product that converts the Aviv Analytical 5977-SMB GC-MS with Cold EI into PFM-GCxGC-MS with Cold EI. Electronic flow and pressure control with gas input and output box. Three way solenoid valve that is mounted on top of the GC. GCxGC column mount plus the two T unions that are connected with the 0.53 mm ID deactivated fused silica storage tubing. Syringe, vials and pentane vial for the optimization of the PFM-GCxGC operational parameters. PFM-GCxGC 2D data presentation software (qualitative only). Aviv Analytical is willing to develop PFM-GC-GC-MS with Cold EI method with optimal columns on customer sample. In the Figures below we present the PFM-GCxGC control software (Figure 1), photos of the PFM-GCxGC hardware (Figure 2), typical data of PFM-GCxGC-MS with Cold EI analysis of jet fuel JP8 (Figure 3) and 2D presentation of the jet fuel analysis as above (Figure 4). Figure 1. 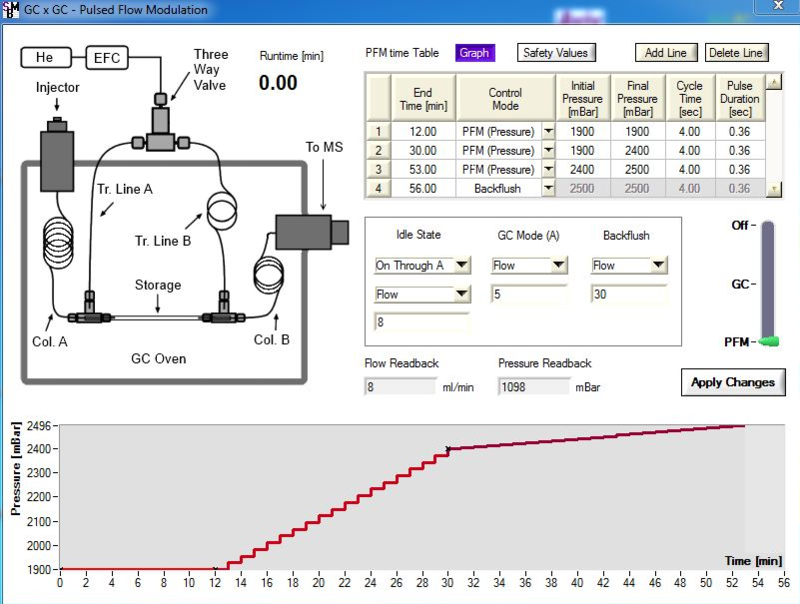 Aviv Analytical's Pulsed Flow Modulation GCxGC control software window with method parameters that were used for jet fuel JP8 GCxGC-MS with Cold EI analysis. When not in method development this window is minimized into a small window of readbacks. Figure 2. Photos of the Aviv Analytical Pulsed Flow Modulation GCxGC. The left side photo shows the electronic flow control and gas input and output box (removed cover) plus three way valve that is mounted on top of the GC. The right side photo shows the second GCxGC column mount plus the two T unions that are connected with the 0.53 mm ID deactivated fused silica storage tubing. The first GC column is shown at the rear of the GC oven. An additional T union is shown, connected to an auxiliary EPC and is not a part of the PFM GCxGC. Figure 3. 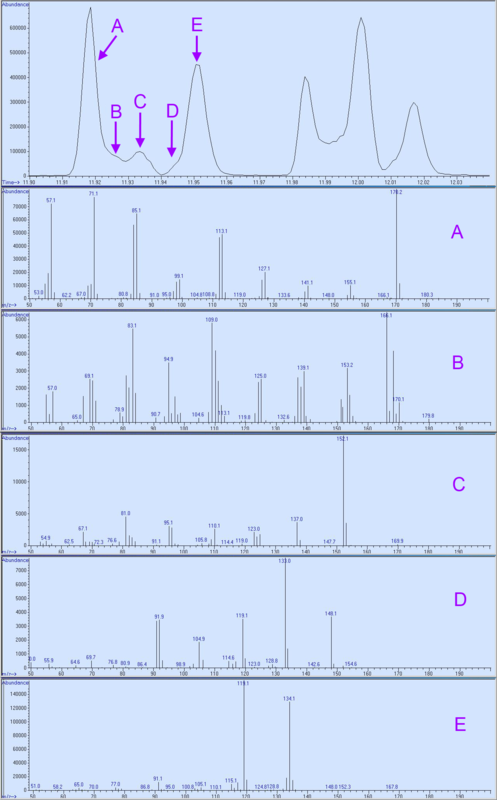 A section of the total ion count mass chromatogram of two cycles of PFM-GCxGC-MS with Cold EI of jet fuel JP8 (upper trace) and five Cold EI mass spectra A-E of GCxGC-MS peaks A-E in the first (left) GCxGC cycle from about 11.90 min to 11.97 min. Note the inverse correlation of the sample compounds molecular weight and their second dimension elution time. Figure 4. A two dimensional plot of PFM-GCxGC-MS with Cold EI data of JP8 jet fuel using the Aviv Analytical data presentation software. M. Poliak, A. B. Fialkov and A. Amirav "Pulsed Flow Modulation Comprehensive Two-Dimensional Gas Chromatography Tandem Mass Spectrometry with Supersonic Molecular Beams" J. Chromatogr. A. 1210, 108-114 (2008). Please contact us to learn more on our PFM-GCxGC-MS with Cold EI and how it can help you in your challenging analysis.